Same 9-second long video without the sound edit. I am against ancient superstitions as much as the next guy, but this is shameful. It strangely sounds like this sound bite, which would render it as fake. Is this a fkin JOKE? LMAO! Looks like they are just "instigators". Seems like you're doing the instigating here! The pictures doesn't mean anything. Just two dumbsheet guys photobombing! I could have have included the Tweet it was attached to, but that tweet was full of profanity. And all those that were cheering the 911 attacks. All those were faked as well. DO NOT post audio from your family reunions dubbed over legit news stories. I strongly suspect the audio is dubbed in. But, then again, I'm quite certain we'll never know the truth of how the fire got started. If it was radicals that set the fire.............the French Government would naturally suppress that information..........and if they don't, the US MSM will. Welcome to the "Post-Truth" world. eyeballs, as he draws out the restoration plans, which will doubtless include lots of eu support, funding. Keep watch for other globalist heads of state from other regions of the world creeping into the frame for a good photo op. say it and others will read it. This too shall pass, if we let them take it. emerge to bask in a positive light. The bottom line is globalism is a dying beast, but still has a deadly venomous pulse, and a catastrophe such as this would be a perfect vehicle for the slimy and loathed macron and his boudoir buddies to dash forward to garner and grab as much perceived French pro-nationalist publicity as possible. I could be wrong, but this idea is far from being an impossibility. Here's some evidence to support a truthful audio track. 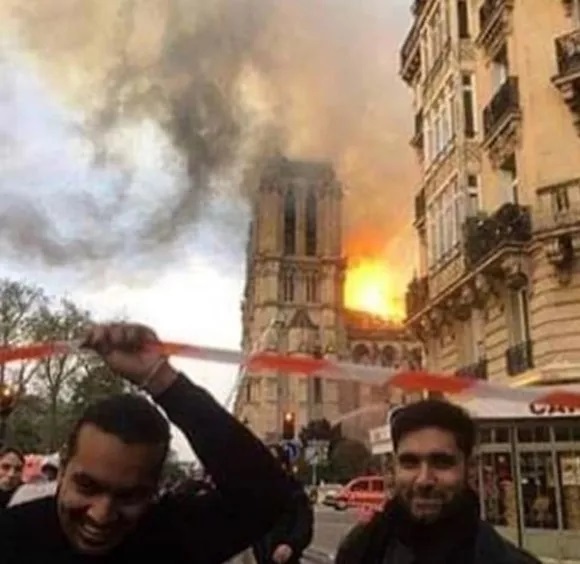 These guys sure look pleased that the Cathedral is burning. I'd bet these two men are Muslim.